Today: Skewers, yakitori chicken, broccoli rabe, and ricotta—have it all at dinner tonight. You want everything for dinner tonight and you won't settle for anything less. Well, have we got a meal for you. Satisfy your animalistic hunger by tearing pieces of flavor-packed Negima Yakitori off a skewer with your teeth between bites of the subtler, humbler Olive Oil-Braised Broccoli Rabe on slices of baguette. This meal, which has just the right amount of variety and balance—Asian-inspired chicken and an Italian preparation of broccoli rabe—just might satisfy every craving you have. We are assuming you already have salt and pepper, crushed red pepper, butter, flour, olive oil, canola or vegetable oil, cornstarch, garlic, sugar, and soy sauce. If not, add those to your list, too! About an hour and a half before dinnertime, prepare for culinary battle. Preheat the oven to 350° F and make the yakitori marinade in a small bowl. Set some of the marinade aside for basting later before placing the chicken in the bowl of marinade. Let it sit while you prepare the broccoli rabe. In a large saucepan, start cooking the rabe—it takes about 50 minutes to cook, so you want to give yourself plenty of time. While it cooks, mix together the ingredients for the pine nut crumble then put it in the oven for 15 to 20 minutes until brown and fragrant. Sit back and grab a sip of wine while the ingredients do their thing. With only 30 minutes until dinner is ready, thread the chicken and scallions onto skewers. Then, in an oiled cast iron pan, cook the yakitori in batches over medium-high heat, basting every 30 seconds or so with the marinade you set aside earlier. 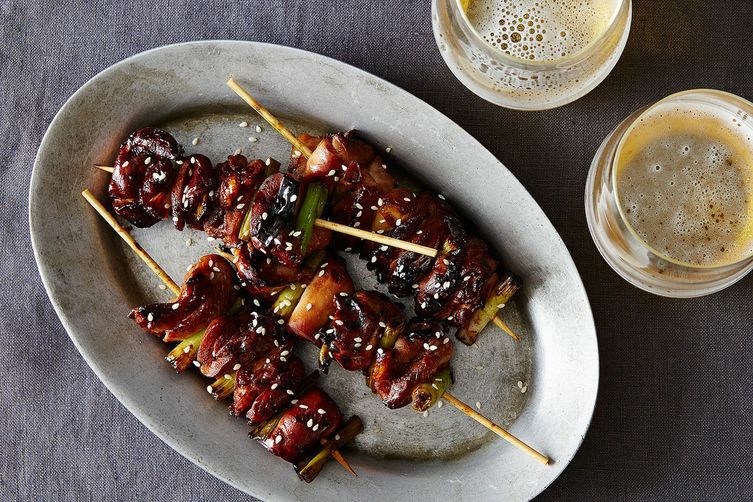 Once the skewers are cooked, sprinkle with sesame seeds—you're almost finished. 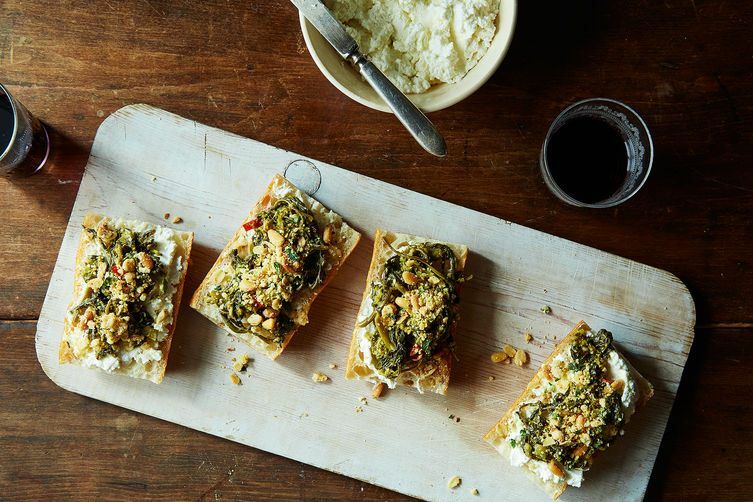 Thickly spread ricotta on slices of baguette, then top with the broccoli rabe and pine nut crumble—or serve dollops of ricotta atop the rabe and crumble. Or do both. Your dinner is complete. Yakitori is my FAVOURITE (especially the negima type), I prefer the shio flavour but this still looks incredible!